It's August first. And some of you know I've been collecting entries for a giveaway through June and July, for which I promised to announce a winner in early August. What you may not know is that when I say I'll draw a name out of a hat, I mean it quite literally. So here is the hat in question, an Australian Akubra that was given to me as a gift while I was touring Australia and New Zealand in 2001. Ella is normally a bit camera-shy, so why she decided to plant herself front and center in one of these shots, I can't say. But I saw no reason to push her away. Enough of that. 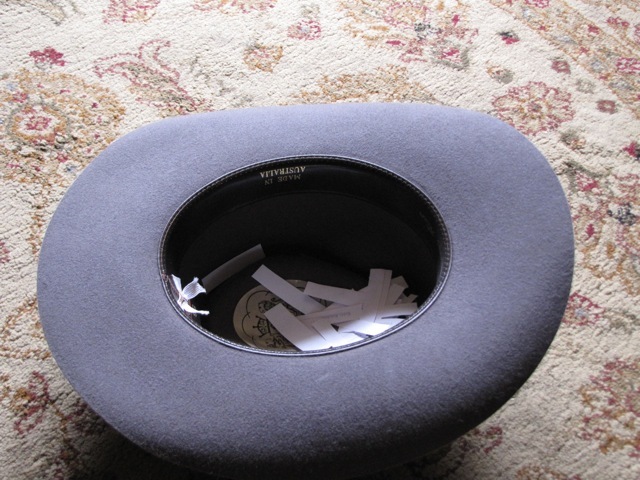 Time to say whose name came out of the hat. Sarah E. The winner of the Jumpstart the World advance reader's copy is Sarah E.
For those of you who entered but did not win this time, good news and bad. Bad news is, that was my last ARC. Good news, I'll be receiving a carton of author hardcovers in a couple of months. And, when I do, there will be more giveaways.